It’s still Winter, even though the weather in Utah has been ten kinds of insane. She’s a fickle little diva, that Winter. 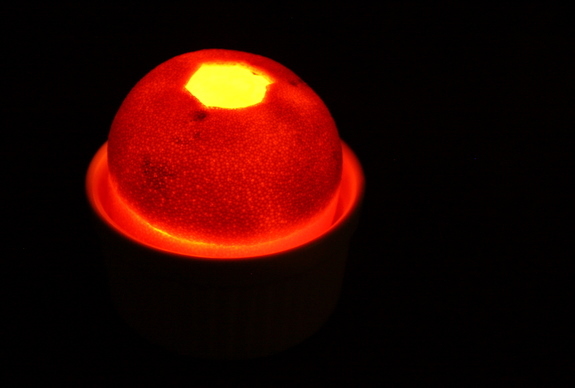 Anyhow, since citrus is so widely available in the depths of despair December/January it’s a fun time to get your craft on and whip up a tea light made from an orange. Or three. 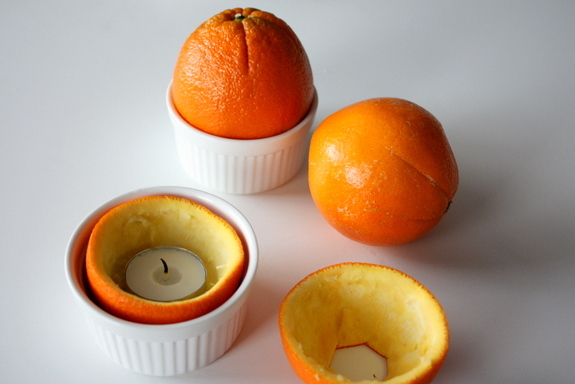 Martha, procurer of all things beautiful, taught me how to do this little bit of magic with oranges and I’ll tell you what: it’s a super easy and totally gorgeous craft. I just don’t have time and/or energy for any drawn out nonsense, and my guess is neither do you. But this would be a little bit cool and romantic to try for a cozy Valentine’s day dinner. Maybe I’ll whip out some magic and impress Viktor. Then again, maybe I’ll eat a protein bar and have a Downton Abbey marathon instead, boys optional. 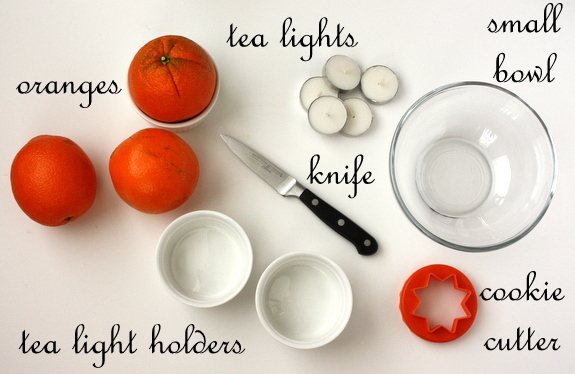 So here’s how it all breaks down, the nitty gritty details you need to know to make your own tea light. 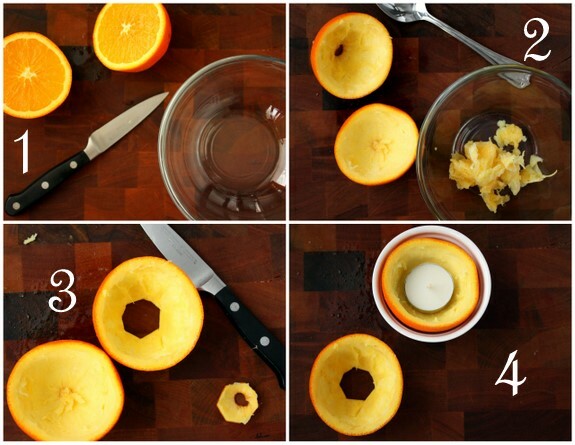 Step 1: Slice an orange in half right down the middle, not top down from the stem. 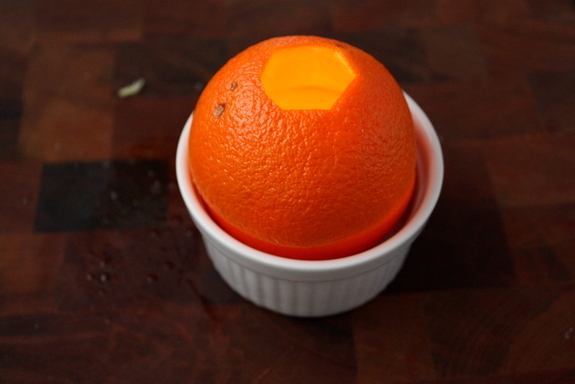 Step 2: Use a spoon to scoop out the guts of the orange, the same way you’d carve a pumpkin. Step 3: If you have a metal cookie cutter that will cut through the orange peel, use it to cut a shape out of the top. This will be the top, the fire escape so it needs to be at least a couple inches across. I ended up cutting a shape out with the paring knife because my cookie cutter was a pansy. Step 4: Place the other orange half the bottom half, in the tea light holder or ramekin, put the tea light in the middle, and you’re done. You are a ninja made of crafty awesomeness. Light the candle, put the lid on, and prepare to blow minds. This is a seriously gorgeous tea light. If you make a handful of these bad boys, invite people over to experience the magic that is you. You’ll have people swooning at your skills, whispering to one another in hushed reverential tones about your brilliance. I’m pretty sure that’s how this whole thing will play out. 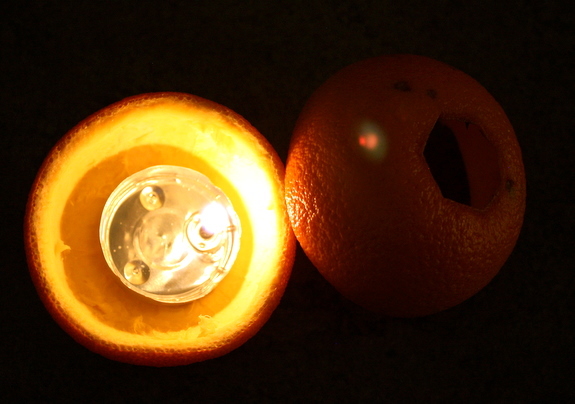 Look at you, you just made a tea light out of an orange! There’s really nothing you can’t do. I’ll make some for you when you come to town. JK you can do these in your sleep tonight! You are totally welcome. Have at it! This craft idea just went on my mile-long list of crafts to do. I must just sneak it up to the top, it’s almost the weekend, right? I love, love, love your writing style, so funny and sincere. Thanks for sharing! Thank you so much for stopping by and saying kind things, it made my day. these would be great to place around the house in the fall/halloween/thanksgiving time as well! Thanks for sharing! By the way, I made your citrus scrub for my Son’s Mom-in-Love at Christmas, my 3 yr old Granddaughter helped, it was fun to do! Of course we got to use some for ourselves after we put all we could in the jar for her! It is so soft, going to make more for me! Thanks for your fun easy ideas! I know, wouldn’t these be cute with little faces? So glad you loved the sugar scrub, I make it all the time! Have you seen the cutie lanturn on utube. So cute, so fun and sooo dosen’t use a candle!! Totally like magic!! 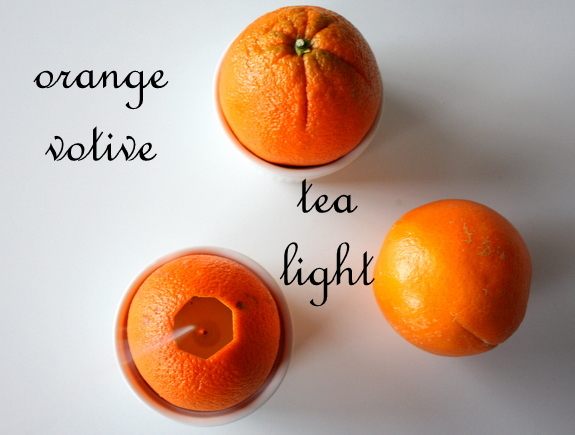 Love the tealight idea….. does it have any smell to it? If it does it would be great to add a couple red hotts inside to have a cinnimin orange smell! Oh, that is my favorite smell. Wow! I can’t believe Martha thought of this. Usually when Martha’s involved it automatically means looks easier said than done. But man, this is awesome! I also love love LOVE your blog! I’m following your blog since it gives me a lot of ideas for green living blog, and my daily life as well! Love your style too. That’s one style of writing that I try to do but can’t achieve! That is very true. Usually her stuff is way too complicated! I love putting the top back on. That’s a nice touch! 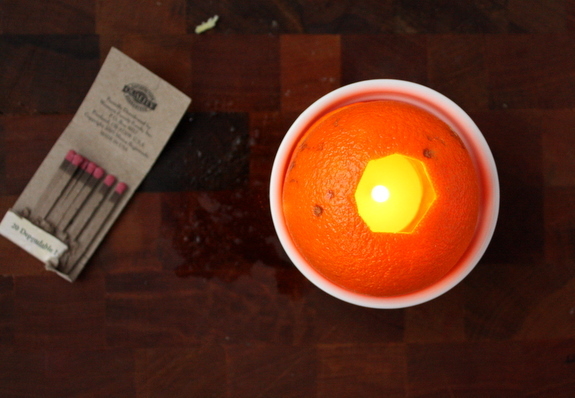 Did you know you can just add oil to a candle and light the stem inside? It totally works and it’s really cool!